F, J, H, A, that could be part of a test at the optician´s, but it is the vocalist, drummer, bass player and guitarist, respectively, of MOUNTAIN THRONE. A and J are also active in MIRROR OF DECEPTION. Doom and traditional metal joins in a fine mix according to the info sheet. Please note that this is a vinyl-only release. The opening heaviness of “Altar of Reason” reveals two of the band members. Otherwise this is closer to the eighties, and NWOBHM in particular. I would, apart from the doom laden parts, put my money on CLOVEN HOOF or early ELIXIR. The feeling of England 30 years ago is enforced in “Endtime”, a slightly faster track. The solo is a gem in all simplicity. The title track is a modest and short instrumental, which leads them astray from their 80´s style. A slower variety of CANDLEMASS is on offer in the melodic “The Forest” with a kind of perpetual riff loop. 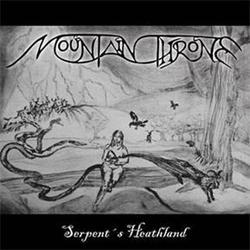 MOUNTAIN THRONE have a comfortable journey, switching smoothly between doom, CIRITH UNGOL and NWOBHM. Closer “The Merry Men”, which isn´t particularly merry, has a haunting melodic pattern. They do a grand effort here, but four songs plus an instrumental is too little to be the basis of a high mark. I recommend this one strongly, and please, Cyclone Empire, offer this lot the opportunity to release a full-length album.